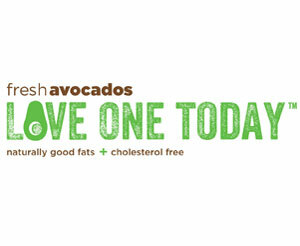 Hass avocados are the most popular avocado variety in the US. This avocado’s flesh is a yellow-green color and has a luscious, buttery consistency and a subtle nutty flavor. It is sometimes referred to as an Alligator Pear because of its pear-like shape and green skin. The name avocado is derived from the Aztec word “ahuacatl.“ Avocados make a great addition to salads and sandwiches or can be pureed to make guacamole.